The Chinese Warriors of Peking will come to Pepperdine University's Smothers Theatre in Malibu on Friday, September 28, at 7:30 PM. Featuring a mixture of high-intensity martial arts and breathtaking acrobatics, the Chinese Warriors of Peking tells the tale of two rival martial arts disciplines competing in the ancient Chinese capital of Peking during the Ming Dynasty (1368–1644). 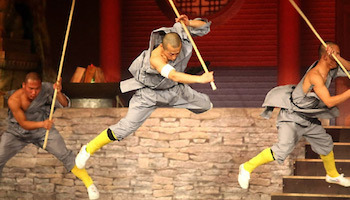 With juggling acts, dazzling acrobatics, weapons handling, and live stage combat, the Chinese Warriors of Peking provides a culturally enriching experience that's “an entertaining show for the whole family” (Eastbourne Herald). Ticket prices range between $20 and $45, and are required for admission. For additional information about this performance, and to purchase tickets, visit the Center for the Arts website.